This teriyaki chicken stir fry recipe is full of chicken and colorful veggies, all tossed in a sweet and savory homemade teriyaki sauce. This chicken teriyaki tastes like it came from a restaurant but is so easy to make at home. It’s healthy, quick and kid friendly! So it’s no secret that I love stir fries. In fact, many of the most popular recipes on this site are stir fries! This teriyaki chicken stir fry is a little bit different because it’s got the whole sweet and savory thing going on with the sauce. Plus all of those brightly colored vegetables just make me happy, it’s like a rainbow on a plate! 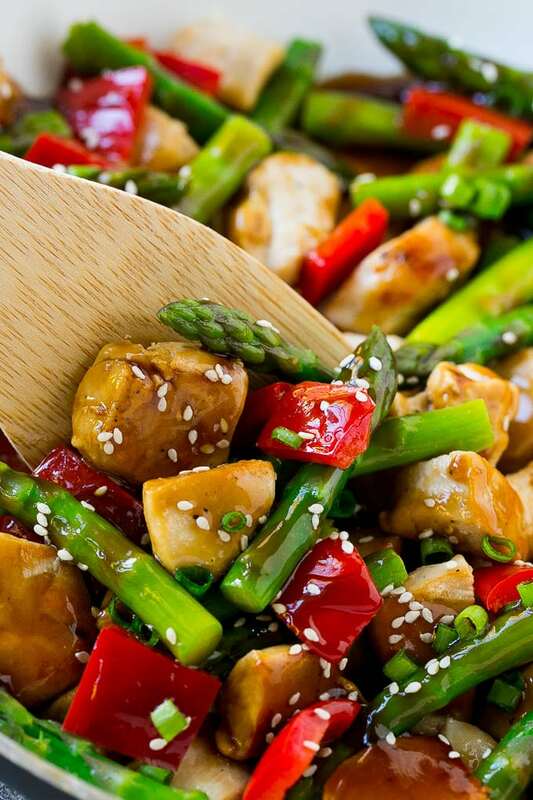 The first step in making this chicken teriyaki is to cook your veggies. I used a combination of asparagus and bell peppers here, but other great options would be broccoli, mushrooms, red onion or carrots. After the veggies come out of the pan, the chicken goes in. 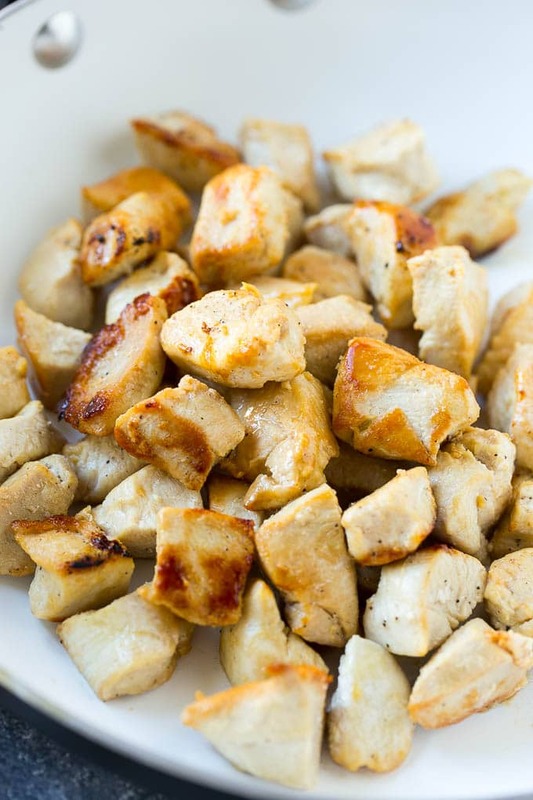 I use chunks of boneless skinless chicken breast, but you can use cut up chicken thighs if you prefer. While you cook the veggies and chicken, make the teriyaki sauce. Pour the sauce into the stir fry, top with sesame seeds and serve! Homemade teriyaki sauce only takes a few minutes to make, but if you’re really pressed for time, you can pick up a bottle of store bought sauce and be good to go. My favorite way to serve this teriyaki chicken stir fry is over rice. You can use brown or white rice, whichever you prefer. Other great options are quinoa, or some type of Asian noodle like soba noodles, rice noodles or chow mein noodles. Eating healthy has never been easier (or more delicious)! Heat 1 teaspoon of the oil in a large pan over medium high heat. 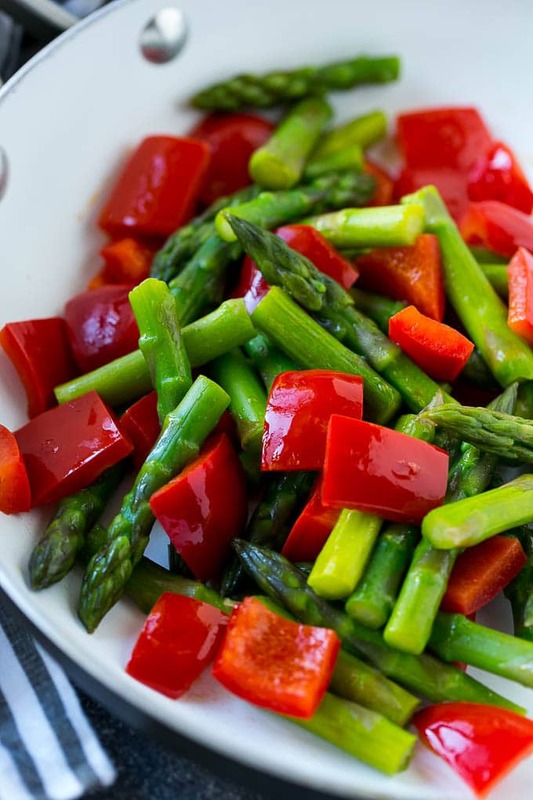 Add the peppers and asparagus and cook for 3-4 minutes until softened and lightly browned. Season to taste with salt and pepper. Remove the vegetables from the pan; place on a plate and cover with foil to keep warm. Add the remaining 2 teaspoons of oil to the pan. Add the chicken, then season with salt and pepper to taste. Cook, stirring occasionally, until the meat is browned and cooked through, 4-6 minutes. While the chicken is cooking, make the sauce. 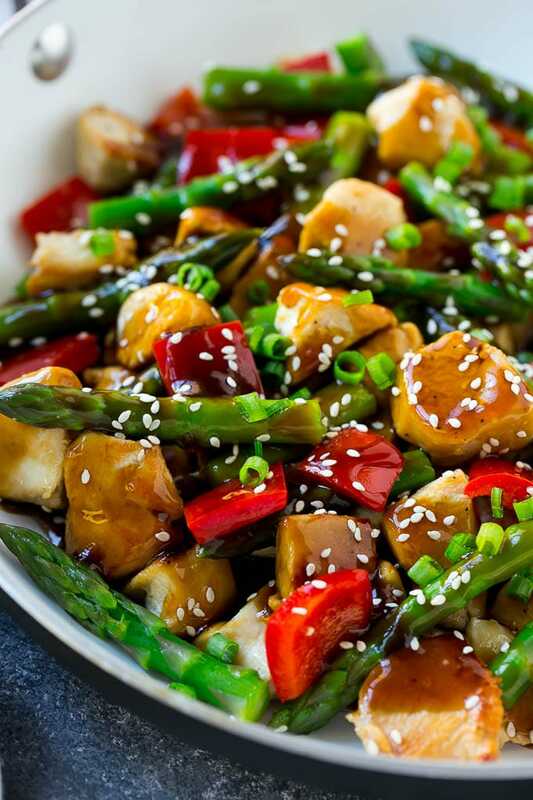 Place the soy sauce, water, brown sugar, garlic, ginger, honey and sesame oil in a small pot over medium high heat. Stir until sugar is dissolved, about 3 minutes. Turn up heat to high and bring to a boil. Mix the cornstarch with 2 tablespoons of cold water until dissolved. Add the cornstarch mixture to the sauce and boil for 1-2 minutes or until sauce has thickened. Add the vegetables back to the pan with the chicken. Pour in the sauce and toss to coat. Sprinkle with sesame seeds and green onions, then serve. You can mix and match the veggies here, other great options are zucchini, broccoli, mushrooms and red onions. Concerned about your sodium instake? 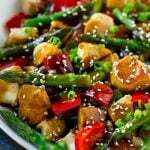 Use low sodium soy sauce in this recipe. This post was originally published on April 5, 2017 and was updated on January 1, 2018 with new photos. Can you use ginger powder instead? If so how much should you use? You can, I’d use 1/2 teaspoon! Best teriyaki sauce I’ve tried!! I’ve added a bit of pineapple juice and that’s all I changed and it was a hit with my family! Thanks! So happy to hear that everyone loved it, thanks for reporting back! Made this recipe last night adding mushrooms… very yummy!!!! Wow! This is perfection. My two toddlers (2 & 3.5 years old) gobbled it up without complaint. Quietest dinner I’ve had in a LONG time. This is a keeper. Thank you. This is the best stir fry I’ve ever made. Thank you for sharing it! The whole family loved it, too. Totally amazing! I’ve never knew that this sauce is so easy to make and it tastes wonderful, especially when its soaked in broccoli’s hairy heads, yum! A perfect dish for the new year. Teriyaki has such a unique flavor. I just love it! Pretty looking dish! I will try this recipe tomorrow. I also want to try making my won teriyaki sauce too. This looks delicious and flavorful! Perfect that it’s so easy to make too! Perfect recipe for any day of the year. I am adding this to our menu plan. I love your choice of veggies. I only usually add onions and mushrooms. I will try making my own teriyaki sauce too. Had no idea it was just that simple to make! I love stir fry recipes because they’re packed with flavor and easy to put together! I think this one’s perfect. The teriyaki will definitely make this even tastier! I love teriyaki chicken. I haven’t made it in so long, I need to make some soon. 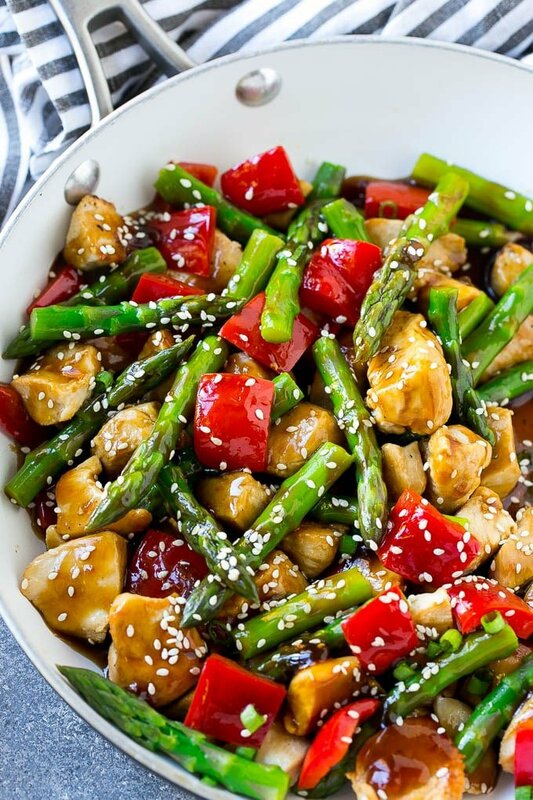 This teriyaki chicken stir fry looks so delicious and healthy for you. I have been looking for some new healthier recipes to add to my meal plans for the new year. I will have to add this one to my list. That sounds super delicious! I think my whole family is going to love this. That looks so good! I love to make dishes like this that are both healthy and full of great flavors. I can’t wait to make this for the fam. Looks so healthy with all these colorful vegetables!